The Hungarian government presented a set of draft laws on 18 January in yet another attempt to target non-governmental organizations and obstruct the work of human rights defenders. The new proposals mark the latest initiative in the government’s escalating effort to crackdown on the legitimate work of civil society groups seeking to promote and defend human rights, provide legal and social services to people in the country, and publicly express dissenting opinions in the press and on social media. Amnesty International calls on the government to withdraw the draft laws in their entirety as they contravene Hungary’s obligations under international law. The Hungarian government’s proposal on the “Stop Soros” legislative pack comes amidst a wider effort to stigmatize specific individuals and associations, and has been presented as a bid to stop “illegal migration”, to “strengthen the protection of borders” and to “protect Hungary’s national security interests”. If adopted, the laws would require organizations that receive funding from abroad — and that allegedly “propagate mass migration” or “support illegal migration” — to, among other things, register with the authorities acknowledging such “illegal” activity and make this stigmatizing information public, for example by putting it on their websites. The draft laws also contemplate a new exorbitant tax on any revenue received from abroad, with organizations required to hold a separate bank account for such funds; and would impose new restrictions on the movement of Hungarian nationals and others in the country involved in migration-related activities. The proposals also include provision for the exclusion of nationals of other countries from Hungarian territory. Human rights defenders and civil society organizations focusing on the rights of migrants and refugees in Hungary have long carried out work in support of the right of individuals to seek and enjoy asylum, and to ensure that Hungary complies with its international obligations to provide protection for persons fleeing persecution. Hungarian authorities have sought to publicly demonize migrants, refugees and asylum seekers. Amnesty International believes that far from being an effort to stem migration, this set of laws is intended to step-up the harassment and intimidation of independent human rights defenders and civil society organizations in Hungary. The newly proposed legislation would put further restrictions on the ability of Hungarian civil society organizations to carry out their work by falsely labelling their activities as “illegal”, imposing arbitrary and disproportionate administrative burdens and exorbitant fines, and implementing unjustified restrictions on the right to freedom of movement. On 20 January, Gyula Budai, Fidesz MP, publicly named the Hungarian Helsinki Committee, Hungarian Civil Liberties Union and Amnesty International as three non-governmental organizations that “support or organise illegal migration”. The Head of Cabinet of the Prime Minister later claimed to have a list of organizations that allegedly “support illegal migration”. The Hungarian Civil Liberties Union has requested access to the list under freedom of information laws. The new requirements proposed in the draft bills would be in addition to the administrative burdens imposed on civil society organizations in June 2017, after the Law on the transparency of organizations funded from abroad entered into force. That law mandated that organizations that receive funding from outside Hungary register with the authorities and included provision for fines and criminal sanctions for those who failed to comply. Infringement proceedings for breach of EU law initiated by the European Commission against Hungary after the 2017 NGO law was approved are currently pending at the European Court of Justice. 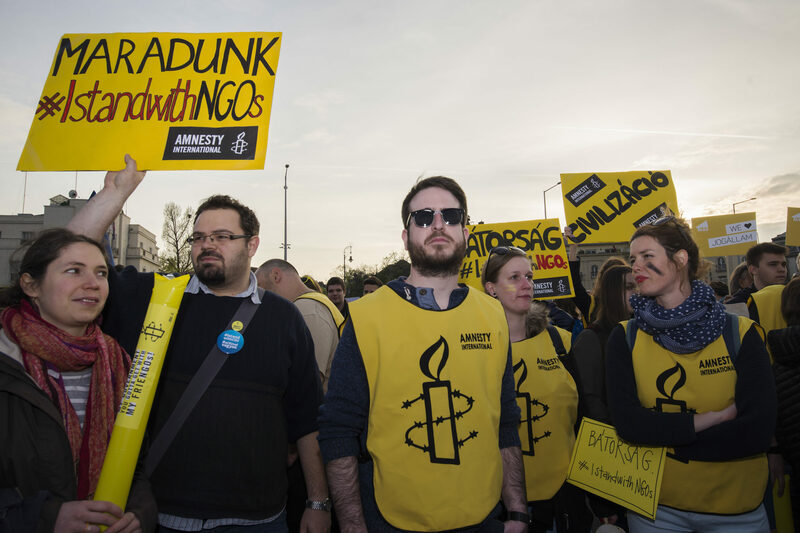 Amnesty International Hungary has refused in principle to comply with the June 2017 law and, together with other organizations, is currently challenging it before the courts. International human rights law and standards guarantee the right to freedom of association, which includes the right to form and join formal or informal groups to take collective action, which is a critical element of the work of human rights defenders. States have an obligation to provide the legal framework for the establishment of associations and must abstain from unduly obstructing the exercise of this right. The right to seek, receive and utilize resources, including from international and foreign sources, is an essential element of the right to association and it is also enshrined in the UN Declaration on Human Rights Defenders. Under EU law, member states cannot place unjustified and/or disproportionate limitations on the free movement of capital, including funding from outside the EU. The authorities have opened a three-week public consultation period that will end in early February, after which the bill would go to the Hungarian parliament for debate and vote. Dishonest – The proposals are not an effort to stem migration, but to step-up the harassment and intimidation of independent NGOs and civil society more broadly in Hungary, which began in earnest in 2013, is reflected in the June 2017 NGO law, and continues with these draconian proposals. Arbitrary – The government does not retain absolute power to determine who in civil society is engaged in important work and what financial resources should be available to them. Under international law, people have the right to form organizations and to work together to achieve goals in the public interest. Damaging — Every NGO or civil society organization in Hungary that receives foreign funding is at risk of losing its status under this proposed law. That could mean a radical reduction in the ability of civil society to promote civil and human rights; preserve legal and social services not provided by the government; and advocate for the protection of other sectors that work in the public interest, including for a free and independent press.